It wasn't until I met my significant other, Zach, that I realized what a foodie city Chicago was. From upscale food to casual dining and everything in-between, they have it all. They have even developed their own versions of pizza and hot dogs. I mean, whoever thought to put the tomato sauce on top of the pizza?! Well, Chicagoans did and they also thought of this unique way of making hotdogs. Zach decided to show me just how it is done, vegan-style, then I added a little flare afterwards. Begin by dicing the onion, then cut the dill pickles into quarters. Begin cooking your vegan hot dogs as according to the package. You can usually either boil, grill, or saute them. I chose to grill them on my grill pan. We found that the hot dog buns that we bought had way too much bread so we actually hollowed out the top of each one by cutting and scooping some of the bread out, leaving the outside layer intact. This also made more room for the toppings. Once the hot dogs are cooked, place them in the buns, then top with diced onions. Squeeze mustard on one side. Fill with tomatoes on one side and pickles on the other. Then, sprinkle with celery salt and top with sport peppers. 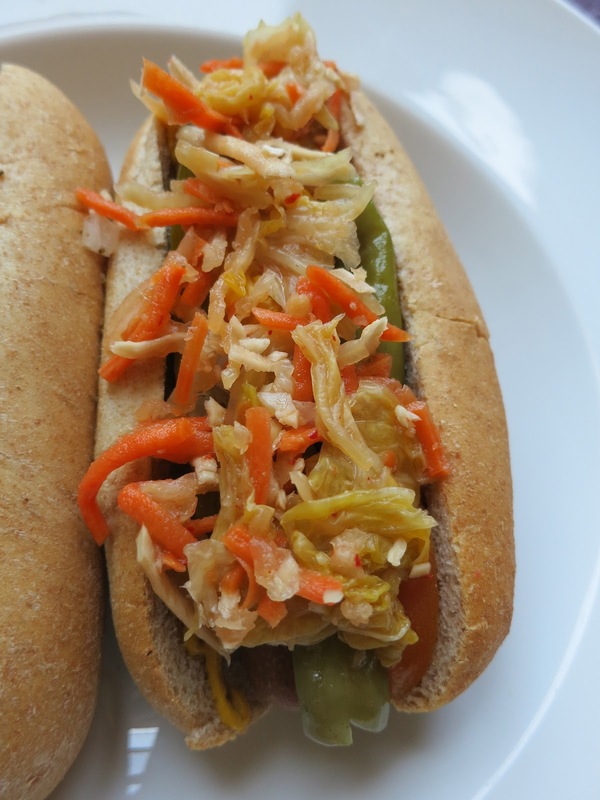 These hot dogs promise to be a taste explosion in your mouth. They are so good! How can I ever eat them with just relish ever again? Chicago, you have ruined me. But, now, for my take - I also topped them with Wildbrine's Miso Horseradish Kimchi. Kimchi hot dogs you say? Don't knock it until you try it. They are darned good and spicy! Quick note: this was our first time trying Field Roast frankfurters and we thought they were out of this world. They are definitely some of the best tasting vegan hot dogs I've ever had. No wonder they are currently Field Roast's top seller. Thank you for this recipe (and product suggestions). I had a Chicago-style hot dog w/o dog (since there were only meat ones) back when I was a teenager--@ 17 years ago. I loved the flavor combination but could never quite replicate a vegan version for myself all these years. I'm going to try out your version sans kimchi as soon as I can gather all the ingredients. Awesome! Please let me know what you think! The peppers make a big difference. Since I can't find them in grocery stores in DC, I found them at the World Market. The Tofurky Kielbasa sausage makes a good grilled hot dog with the fixins.